There have been numerous posts in my blog about the “Third Way”. This is probably the last, about the “end of the Third Way” and the lifestyle that’s enabled when arriving there. It is also, most astonishing, the last to the “Second Acts” series of posts, canceling that project resp. leaving it to be “just some visits” while on my tour through Africa. Miracles seem not to happen in people groups that can be expected to realize that Jesus is the Christ by looking at the Scriptures and judging them by their history etc.. Abraham said, when requested to send Lazarus back from the dead, they have the Scriptures – may they hear them. They really had the Scriptures, as they were in a culture that was enabled to judge and understand them. (However, Jesus performed miracles also among the Jews … perhaps to have them written down as scripture for us to believe, see the Gospel of John: these are written so that you may believe.) The Romans and Greek were not in a culture to understand the scripture of the Jews, that is to judge them correctly, even if translated to them; so they experienced miracles. And today, it seems that miracles happen mostly in regions and people groups that either do not have the Bible at all, or do not have the education to be able to see its truth. (I got this impression when watching the “finger of God” film and subtracting the decadent alleged miracles.) This general rule might have many exceptions and should not be thought of as a rigid one, but it seems to be a general rule. This also means: the fact that Jesus is the Christ can be realized by looking at the Scriptures, and by judging the reliability of the Scriptures by looking at other artefacts of history. In our Western culture, it needs no miracles for that, and I should not expect them for that. Means that the role of miracles as “signs” is obsolete here. Intellectual people are blessed because they had the possibility to gain education, so God seems to expect they also use their education to get to know something about God. So all in all, it seems that being a Christian in a Western culture means: believing that Jesus is the Christ, on the basis of history and written tradition (“Scriptue”), and trying to live accordingly. But without expecting supernatural experiences at all (they might happen nonetheless, however). Means, life feels “all natural”, as there is normally be no direct, supernatural contact to God, either, so no visions, voices etc.. “Only natural ingredients”. This is a very relaxing view of life and “religion”. It concedes that there is some mystery in what we believe: we do not really know why God does not want to be more obvious. But what about answers to prayers? Christians may pray, and expect answers to prayer. Also in highly civilized societies. According to my observations, what one can expect as answers are solutions to problems, but implemented with natural means, normally no “signs and miracles”. The difference is: signs and miracles prove that there is a supernatural agent (God), while solutions only justify to strongly assume, but not to know, that God was at work. Nonetheless, it’s possible to live that way, even be thankful for what one assumes to be the work of God. It just is no immediate encounter with God, again emphasizing the importance we in highly civilized societies must attribute to history and written tradition (the “Scriptures”). Of course, searching confirmation for what we believe about God, by searching for his contemporary activity, is not forbidden. But don’t be desparate doing so – history is already enough to believe. Also, signs and miracles will be observable in other countries just like they are not observable here. Which means I will need no scientific methods to prove them, just as I do not need them to prove their absence here. Just stopping by and seeing them will do. Conclusion: In essence, it seems to be fact that cultures that can understand the Bible should believe because of the Bible and history, while other cultures will get signs and miracles to be able to believe. This is also ok with intellectual integrity, as it means that a Christian is not to expect supernatural experiences with God when believing in a Western country; so I do not have to search these to confirm my faith, as they are not promised. Which means that the project as a research expedition is canceled, while I will still be interested in seeing God at work whenever I will be able to get a glimpse at it. End note: it it interesting to see how it took 2-3 weeks for my brain to process the “Finger of God” movie, leading me to these conclusions (above) just now. So thinking is a pipeline: for continuous output, you need continuous input, but your feeding is rewarded weeks later. I’m currently reading: Francis A. Schaeffer: The God Who is There, Inter-Varsity Press, 1968. This article is a set of interesting citations from that work, with my comments. It turned out to be the first rather complete presentation of the epistemology behind the Second Acts project, but is still ordered by the order of the citations. No systematic presentation here yet, sorry. But enjoy the read anyway. If this is also an adequet description of the situation today, then the Second Acts project is the struggle to uphold the old concept of truth in this confusing situation. But not only the old concept, even to eliminate its weaknesses. Because the old concept of revealed antithetic truth is that this is no sound epistemology because revelation can be claimed. Truth always must be detectable, and if in addition to revelation. This is probably what Schaeffer will argue that we need to return to. By “absolutes” he seems to mean not God, but objective reality. So because objective reality includes things that “are”, it is false that they are not. To be or not to be is an absolute attribute of things. But: extending that basic statement of natural science to “the area of morals” is not necessarily something I want to see repeated. Dividing reality into “areas” shows a lack of understanding how these areas are connected, so that reality is ultimately one area. With only one type of absolutes. With respect to morals, there is no need to treat them as absolute, pre-existing “things”. Instead, it’s only needed to think of God as being “pre-existing”, because morals can be thought of “his will”. That will of God finds its expression also in the (God-created) fact that societies work (“are stable, and cause no harm or pain”) only if based on this will, which is basically the principle of mutual love. So here, I see “morals” as just an abstraction, nothing that has an own existence. That is, I see atoms and information as the only entities of which objective reality is composed. (A spirit, in my view, is basically a self-referential information-based system, which might or might not incorporate atoms in the system. Such a system is also called a “person”. I will elaborate on that later.) The one upside of this thesis is, it offers a “continuum reality” incorporating both spirit and matter, but not as separate categories or realms, but heavily intertwined, e.g. in man. Of course this thesis has to be tested, e.g. by its claim that persons can be composed of matter and information, and because matter can serve as a substrate to store and process information, that persons can be fully implemented in matter. That claim could be verified by building a self-referential computer system that offers basic person-like attributes, like qualia. Schaeffer claims that humanism is the unity within non-Christian thought both in the old antithetic and the new sythetic approach to truth, but in different forms. In my view, there is a third way that’s not humanism and not the traditional Christian view of revealed truth. I assert that it is an alternative that is theoretically feasible but might be practically impossible because of man’s “quality”. That’s no problem however, as we’re dealing here with finding a sound epistemology, not necessary a practicable one. For the first step, it would be good news that there is such a thing, meaning that it is at least in theory possible to have justified knowledge. Now what is this epistemic approach that I want to propose? Just as humanism, it starts with man. Because recognizing truth is, lastly, a process that must be done by each person individually and himself, meaning that it’s impossible to just copy the results over to somebody else. And because it’s a person that recognizes truth, it starts with the person. Recognizing truth (“forming adequate information about the world”) is the process by which a person makes sense of the world. This starts with recognizing ones own existence, as separate form the external world. That is, with recognizing man. Determining truth starts with the moment our brain started to work, as it received sensual information of the external world and starts to make sense of that. This radical view that relates epistemology to individual history as a man is largely neglected, but necessary. Normally, Christians state that “all starts with God’s revelation”. But: this assumes persons who can receive revelation, meaning they can speak, think, and are capable of logic. How did they acquire these abilities, and assert all the information as “true” needed to acquire these? Because we cannot neglect this, the search for truth starts with man. But then, in contrast to humanism, man is not the integration point. Because man can decompose himself into basic entities of the objective reality (atoms and information, see above). Therefore, the objective reality is the integration point. And as God is (in the sense of being, and at least from our modeling perspecive) “part of” that reality, meaning and value can be build out of that integration point. As in the case of morals, being the will of God (see above). In the light of the epistemology just proposed, I claim that it is epistemically unsound to “start with God” instead of “starting with man”. Starting with God can only means an a-priori presupposition, because if it’s the starting point then even the knowledge how to experience and verify God is missing. And everything with an a-priori in it is epistemically unsound. Nowadays, we’d use the word post-modern instead of modern, but for the rest, the description is valid. Post-modernism is nothing but covering ones defeat in an unsuccessful search, by re-defining truth. That’s why Schaeffer also calls the transition the “line of despair”. However, there have been multiple alternatives available. First, there’s no need to think that man’s search was unsuccessful: one philosophy might have been correct, but it was drowned in the sea of competing ones. So, the search did not lead to justifiably correct results. That would have been a good point to accept the need for justifiable revelation, and to start searching for it. Second, there would have been no harm in admitting that man is not in the position to be able to determine the basic concepts in reality, because he simply has no access to certain knowledge, and therefore to blatantly give up the search as “theoretically impossible”. It’s really no shame to admit not to know, if one cannot know. Why not? In my view, it’s valid to think, as Hegel, that there is a rational synthesis of both thesis and antithesis, and that this is closer to truth. A yet unknown synthesis after many levels of applying this scheme would be really close to truth, that is, the real antitheiss in the whole process. But because this was not, and could not be known in the beginning, man had to resort to an incremental process of synthesizing, rather than proposing the true antithesis right from the start and then accepting it. So, Hegel’s dualism, if and only if using reason, is a valid approach to the problem that philosophers were unable to find the true antithesis. It is even a good description of the scientific processof model refinement over the centuries. Here, all the mess of post-modern thinking starts. In my view, the solution would have been to “deal with the real things of human life” in the light of rationalistically justified revelation. Yes, rationalistically, not just rationally. As I claimed above that a man, starting with nothing but acknowledging the existence of a unified external world, by making sense of his sense experiences, can come to see some piece of revelation as justified, while others is not. Justified revelation consists not just of the claim to be revelation (as is the case in Islam), but generates supporting facts like signs and miracles, which establish the authority and trustability of the revelation’s source. As my position as put forth in this article so far seems closely related to logical positivism, it seems that I need to justify it here. To overcome the problem as described by Schaeffer, my concept has this to say. There is no need (and perhaps not even the possibility) to formally verify your true system of philosophy. Formal verification is an act of logic, and if you are not in the position to grasp all of the starting conditions exactly enough, you might not be able to apply logic. In this case, if you are not able to verify that what reaches you is indeed “data” about the outside world. Also note that, eben without formal verification of the whole system, conclusions can be drawn (see on “paraconsistent logics”). In this case, what can be concluded about the signals one receives is, that they span out a space of “testable consistent” experience. With repsect to things, they’re even testable in strict empiric manner, whenever you want. Each test is a confirmation that there is a realm of consistent experience, and aggregated, these conformations mount to be scientific (empirical) proof. Empirical proof has, compared with a philosophy that needs formal verification, the great advantage of requiring less form reality to be feasible. Empirical proof is a valid, pragmatic approach to truth. One can then choose to term this realm of consistent experience the “external world”. In terms of conclusions, there is no difference if we start with a real external world, or a realm of consistent experience that we call the external world. Because, conclusions will only affect us in terms of experience, and experience is the same in both alternatives. It does not matter if this world is a Matrix-style simulation and God is outside of it, or if it is a real world, and God is part of it (i.e. consists of matter and / or information). With regards to the conclusions, these alternatives are equivalent. The interesting step in my epistemical system is then, that empirical confirmation of the authority and trustability of revelation is possible. Accepting this revelation is another valid, pragmatic approach to truth. The big difference to the traditional Christian view is that I do not start with revelation that has to be accepted a-priori, on the basis of simply, nothing. To conclude, my epistemical system is not philosophy, but natural science, and (in the case of inter-personal trust in a revelation) social science. It offers no formal verification, as it argues that this is impossible: all that man can know enters through his senses, which is, in the best case, data about an external world. Now with data you can do nothing more than to make sense of it, that is, you will end up with empirical, but not formal / logical proofs. There is no channel by which man can directly perceive the principles that generate the data. And even when it comes to trustable revelation, we have no more than empirical proof (perhaps even a bit less): finding out of a source of revelation is trustworthy is a process that’s imlemented in making sense of sensual data. The revelation might reveal the principles that generate the data, but you cannot be justifiably more sure of it than you can of empirically found proofs. Now the good news is that this way of epistemology, though not formally exact, is totally sufficient to arrive at true information about the basics of reality (it’s more difficult for the details, as the experiments become difficult then). But for the basics: the possibility that you interpreted chance instead of facts gets lower and lower with every repetition of your experiments and perceptions, by yourself or others. Also, it seems to me that all these post-modern philosophies that find no purpose or meaning in the rational and logical, and in the world of things, and see themselves driven to claim a “tital dichotomy” between rationality and meaning, simply did not catch the idea of “implementation”. Matter might have no meaning on its own, but it can be used as a substrate to carry meaning. In the sense that meaning can be derived from the matter. I have this concept from the “implementation” idea in computer science: bits are electrical signals without meaning in themselves, but they can be orchestrated to carry the meaning of a program. And, the meaning of the program (as far as it affects other programs and accessible entities in the real world) can be inferred from the bits, by comparing the operation of the program to what happens in the real world, and finding out what piece of information represents what. That’s reverse-engineering. So what I propose is “reverse-engineering” the material world to find the meaning of man. One should find then, that man is created as an image of God. And that the relationships between plants, animals and human beings were intended to represent love, but now represent in part some diabolic agency. With regard to the emergence of synthesis-based truth, we have to note that it only affects “those aeas that make man to be man – purpose, love, morals and so on” [p. 44]. In the area of concrete, material things, the old antithesis-based concept of truth is still applied, as can be seen on modern natural science. Now the interesting thing of the epistemology as presented here is, it overcomes the difference between these “areas”. Because there are no areas: there is only spirit (information) and matter, and both are connected by implementation. And then, in this uniform area, one can apply natural science with its old concept of antithetic truth, and move on from that without ever admitting something a priori. And arriving at truth in the spiritual categories, by means of justified revelation. The upside is, even post-modern man can join at the start, as they still apply the antithesis-based approac to truth to the material world. Good words. What I marvel at when perceiving such modern art, esp. in poetry and song lyrics, is the adequateness by which they represent their perception of the world. They perceive it as meaningless, chaotic, and they perceive God and his moral will as non-existent, and their art represents it. Despair is not adequately depicted by a part of reality, but by an image of destroyed reality. But in my epistemology, man also starts “with himself alone”, or better, with the study of particulars through natural science and logic, because prior to having a universal man does not really know who he is and therefore cannot accept himself to start with, as this would be something to accept a priori. (For example, if accepting ones own emotionality without knowing if emotions relate to objective entities or if emotions are pieces of information that can, but need not, represent reality adequately.) The difference is that, in my epistemology, there is a way of transition from particulars and mechanics to unity. By using the particulars and mechanics for no other purpose that to test the authority and trustfulness of revelations. Unity is then arrived at by believing those revelations that have withstood the tests. Perhaps I should throw in a hint how I want to test the authority and trustfulness of revelations: claimed divine revelations that have authority will authenticate themselves by signs of divine omnipotence, and trustfulness is established by a blameless record of other revelations that afterwards proved to be true, e.g. by prophetic fulfillments. Where is the problem? Man’s incapability to live out some statement surely is no argument against the truth of that statement. What Schaeffer seems to promote here is a mild form of pragmatic epistemology, in that something can only be true if one can live it out. Though it would be clearly nice that way, there’s no compelling reason why this has to be the case. The same with the popular scientist-in-love example: why should a scientist, just for the sake of strong emotions that he does not yet understand, change his anthropology or epistemology? In the area of epistemology we operate out of the boundaries of immediate experience, so we should get used to the fact that we cannot feel the validity of our epistemology just as we feel love. But to resolve the question in the scientist-in-live example, what is love, by the way? It’s a spiritual concept, i.e. a concept consisting of information only, that is implemented (in the sense of multiple instantiation) in the activity that makes up inter-personal relationships. Namely, it is found wherever such activity is motivated by doing good to somebody. Note that motivation is also a spiritual concept, i.e. a concept consisting of information only, but implemented materially in brain actions etc., and that motivation has a teleonomic aspect. Teleonomics is absent in the world of matter alone, but information (and information-based systems of matter) can have a teleonomic aspect with ease, as it information can represent a situation that should be there, just as it is used to represent a situation that is there. Nice quote! But, Schaeffer has, up to this point in his book, not come up with any solution why Christianity does not require the “leap of faith” that post-modern thought requires ton enter discussing meaning. True, if there were five hundred people to ask about what God didrecently, this would be different. But in the current situation in Western culture, which I describe as man having some hearsay of the Christian God but no confirming experience, a like leap of faith is required to accept biblical content as divine revelation. Which means, simply, that it’s long overdue for us to dive into studying what God does today. All we have in this area seems to be some reports of miracle mongers, which makes everything worse, at best. Currently, I do not know how relevant Schaeffer’s thoughts are for today. True, the intellectual elite is busy with post-modern thinking just as in 1968 when Schaeffer wrote. Also, amorality has indeed entered our societies to an even higher degree, by being portrayed in movies, and by being allowed by some laws. But, ordinary folks are returning to a simple, aphilosopic, purely pragmatic and petty bourgeois form of life. They’re complaining about amok gunners, for example, and just want to live their quiet life in the material realm up to the end, without bothering about God, meaning and the spiritual. Perhaps this post-post-modern attitude can be used as a new start for Christianity in our countries? Hm, I just noticed what Schaffer means by the dichotomy between upper and lower storey, between meaning and rationality. It’s a “divided concept of truth” [p. 80], meaning this: in the lower storey, where man deals with rationality in the realm of the particulars, traditional antithesis-based epistemology is applied. But man could not find meaning through that. Therefore, he “finds” meaning by jumping with a leap of faith to the upper storey, which is said to have no contact with the lower one. There is no reason to jump, and no possibility to validate what is there viz. what one creates there, but “at least it’s about meaning”. Here, the synthesis-based concept of truth is applied, in that man thinks that there is no real antithesis, so that every development in the upper storey happens by creating a new synthesis, involving a new leap of faith. And as per itself, the upper storey is the leap-of-faith based synthesis of rationality and meaning, which were seen as antithetic to each other. In my view, Schaeffer is poor here. A system in itself that is free of contradictions within itself and when applying it to all of life is a valid theory, yes. But if it’s not falsifiable, it’s just a theory of which you cannot known if it’s true. It would be a nice system of thouht, but not grant you the justification to life by it. And, if you have equally valid, non-falsifiable theories, which do you choose? For example, I could make up the theory of “Judaistic deism”, meaning that God ceased to care about the world after the fall or, for the latest, after the deluge. This would also answer questions about man’s origin and fallen condition, but give no hope. In essence, words and thoughts cannot give hope. Facts do, and words have just the task to communicate facts. They are not really good at this, however. Words of Jesus’ miracles while he was on earth are dim and do not ignite hope if they are not re-confirmed by contemporal experience, or trustable words of contemporal experience. On pp. 105-107 Schaeffer goes on to define morals as “that which is according to the character of God”. Which is also my view, see above. Then he speaks about guilt and propitiation as if these were pre-existing things “made of spiritual matter”, rather than concepts fully implemented in personal interaction. This would need another article on demystification, in addition to the existing ones. A. The theory must be non-contradictory and must give an answer to the phenomenon in question. Nice shot, but two concerns. First, he does not show how to deal with multiple competing theories that withstood these two steps of proof. Second, the phrase of the “phenomenon in question” hides that there should be peer review in order to confirm that there is indeed such a phenomenon in question. Sigh. He stops at the most interesting point. Paul did not use these as evidence for the “historic Christian position”, but for the general faith that there is a creator God of everlasting power and divinity, instead of idol gods. This is what considering the external world can bring us to, at most. It does not prove the revelation of the Messiah, meaning that we have to deal with that separately, as a revelation. A problem why I am not easily content with any answer regarding the truth of that Judaistic-Christian system is because I do not accept pragmatical answers. Even Schaeffer, in his book, arrives at a pragmaticals answer to that question in claiming that one must be “able to live with it”; and since it is “dark out there” [p. 131] in a meaningless universe that also attributes no meaning to man, people should rather convert to Christianity. You will find a multitude of answers of this kind. But: a comfortable answer is not necessarily true, and an uncomfortable answer is not necessarily false. Who can guarantee that universe is not structured in one way, while man is structured / programmed in a way to not like it? The question of truth must be answered on a factual level, not a pragmatic one. It’s a circular argument: only because you suppose man to have meaning, you can infer that he is created / structured in a way that he will be able to live comfortably with the truth about himself, from which you can then infer that the truth about himself is that he has meaning, because man cannot live with the opposite. So much to the question of faith is a work if it is based on a human decision. That’s surely right, and the center of the Second Acts approach. But: what Schaeffer means by “individual and corporate exhibition” is something he has talked about before (pp. 151-157). He means by that: exhibiting substantial healing in the psychological and sociological realm. However if these do occur either outside of Christianity also, or else, can be caused by the authoritative Christian message alone (without a God), this is not an “exhibition that God exists in our century”. At least no finally persuasive one. On (Mon) 2009-02-23, I … umh, say, attended a wedding. 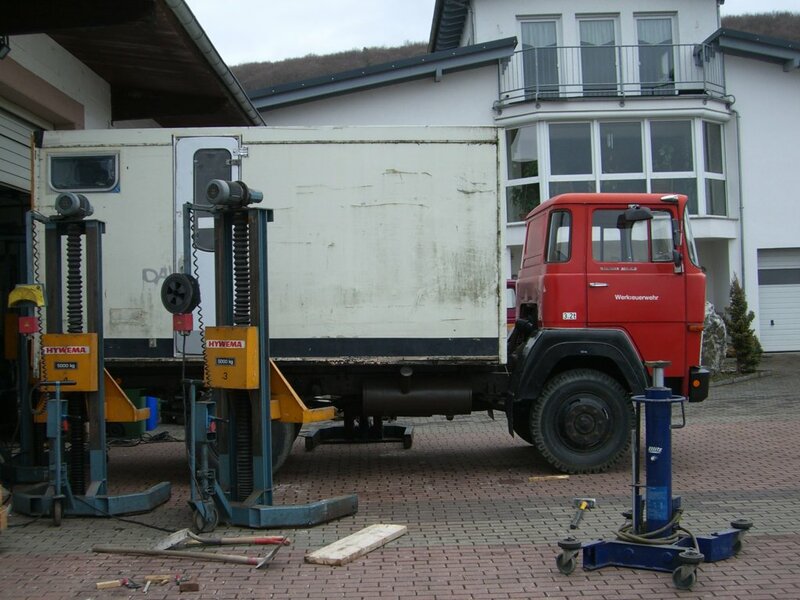 A wedding of my 4WD truck and its box body (German: “Kofferhochzeit”). That’s at least the jargon in my favourite 4WD truck forum. Then, on (Wed) 2009-02-25, the vehicle with its new body moved places and is now just below the window of my li’le flat. Very cool, because now I can work thereon whenever I’m bored of programming! 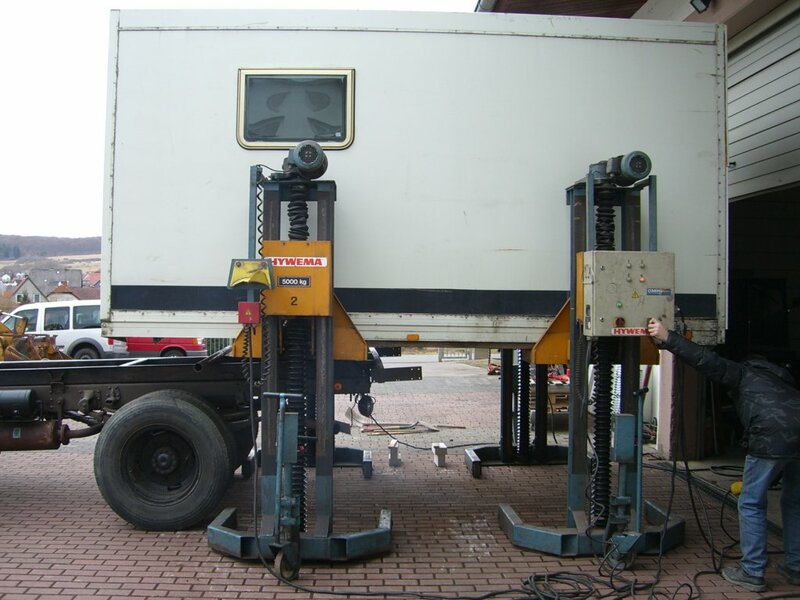 I’m gonna show you some pics of the “wedding”, but before, I need to place an “honorable mention” here: Micha, a friend of mine, really helped me in the substantial portions of preparing and executing the box body mounting. All the things that I either am not able to do or had too little experience yet: re-welding the box body subframe after decreasing its width, helping in the mounting procedure with that crazy lift station you see in the pics etc.. And, what was also very cool, he let me use his workshop and tools whenever I worked on the body or vehicle. And let me use parking spaces for the truck (for 3 months) and its body (for a year) before finally both went off together. 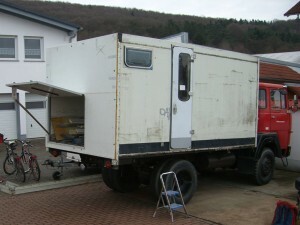 Not to mention that he found both these perfect offers (box body and vehicle) on his journeys through mobile.de resp. 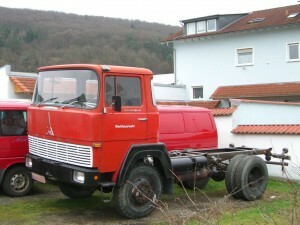 autoscout24.de. 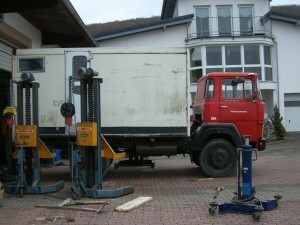 This one shows the setup before the start of the body mounting. Yay, cool lift. Comes in very handy. The truck just before it left its place on (Wed) 2009-02-25. The back flap came in handy already, to load all my tools and stuff in it. Posted in [All], [English], #vanlife, Quantified Supernatural Sciences, Real Life. I’ve wondered once and again why I have such a little level of motivation in my life, when comparing to others. It seems that I’m slowly getting to recognize the causes now. As, one cause seems to be: I did not allow me to be passionate about anything. Why that? As a rational thinker, my worldview is very analytical and decompositional (it comes through e.g. in my post “Logicians also should accept themselves”). That is, the right way to live seems to me to do in every single moment what is “adequate”, where I mean with adequate: being the fitting answer or activity when taking into account the whole context. And the whole context includes: the world, a fallen one; God, a graceful one; ones own abilities; ones social contacts, … . Now, this way of thinking is successful as far as this: it answers what is the best thing to do currently. For example, the whole Second Acts project thing developed that way … it deems me to be the most pressing question to answer. But: this mode of finding decisions does not necessarily lead me to do things that I’m passionate about. While I find the Second Acts project to be deeply necessary, I’m not passionate about it. I would not do it for its own sake if there would be no necessity to do anything at all. Even more strange, my attempt to do what is “adequate” made me even unlearn what is “being passionate about something”. I’m not passionate about computers. While I can program and could be good at it, it’s only a tool for me to do something else. I’m not passionate about money. It means nothing to me, and therefore I’m also unwilling to do a job that does not fit me. I’m not passionate about community. I once was (see my posts on Xpedition Community). But due to non-collaborative people and not finding any fellow members here in Germany, this passion “sleeps” now. I’m not passionate about women. (Well, ok, I readily admit there are exceptions 😉 ) But generally … how could it be adequate in a dying world to have a partnership as ones life content? And I’m not really passionate about God. That’s sad, yes. I mean, God is very important to me and I’d really really like to get closer to God and get to know him better. But I don’t have the passion to deal with spiritual things for their own sake all day long, like praying, talking with people about God etc.. Simply, it currently does not seem to me to be “paying off”, i.e. to be rewarding or of any effect that would indeed make me know God better. It can even leads to more frustration … like seeing and experiencing the non-ideal, all-too-human state of the church first-hand. Umh … and now? Until now, I did not allow me to be passionat about material / non-spiritual things, as I would not think it to be adequate to work so intensively for stuff that will pass away along with this world. But, seeing that being unpassionate leads to a lack of motivation, and, that way, to not working at all, I’m not sure about this whole thing now … . Also, I don’t know anymore what God would recommend … . So, comments welcome, as every time. So, sigh. It seems that I’ve that hard tried to override my human behavior with logic behavior that I lost passion on the way, and motivation with it, for anything whatsoever. I seem to be in an impasse: I neglected that humans need motivation to do anything, and that real motivation comes from passion only, not logic. By the way, what exactly is being passionate? People say, you can only be really good in the things you’re passionate about. Basically, being passionate is having a hobby: you care for something that is not yourself, and feel well if it is well. So, caring for something else “falls back” on you and helps in your emotional well-being. Part of this effect, of course, comes from the fact that the things you care for can indeed help you do better in the physical world (in my case: an expedition vehicle provides accomodation, transportation and shelter). To conclude, something for you to chew on. Let’s take the above definition of being passionate and transfer it to the pair relationship topic. You can only be good in a pair relationship, only have a good pair relationship, if you care for your partner for her / his own sake, that is, because you’re passionate about her / his well-being. If your partner is well off, you feel well; not only, but also because your partner then has the strength to do you well. This might be what they call love. Posted in [All], [English], philosophy, Quantified Supernatural Sciences, Real Life. Regarding the title: In the IT world, there’s the famous differentiation between free software (“free, as in freedom”) and freeware (“free, as in free beer”). Using that as an analogy: it seems that Christians are not really of one accord when it comes to the meaning of “faith”. Some think of it as “faith, as in believing”, and some as “faith, as in faitful”. Let me call these groups the “believers” and the “faithful”, and their occupation “believing” and “being faithful”. Believers think of believing as the fundamentalist activity of thinking something is true, without fact-level confirmation, just based on an axiom. The faithful think of being faithful as the state of being “on God’s side”, even though the truth about God is not as obvious as one wishes it to be, and even though everything is in a mess, seeming to consist of doubts, strange occurrences and spiritual fights only. Now, with respect to my notes on humanities-level believing and fact-level believing I’d say: yes, the reports about the Gospels (and other humanities-based investigations) give reason to be faithful. But they don’t justify the fundamentalist activity of being sure beyond any doubt. Now, accepting that reason and starting to be “faithful” to God, makes one ask if there’s reason to be more sure about what one believes about God. That is, facts. Ok then, welcome to the search for them (in my case I call it Xpedition “Second Acts”). That search is about “looking deeper”: testing the reports, relating reports to what one expects from the current reality because of them … . But remember, regardless of the status and outcome of this search, there’s reason to be faithful to God. That’s good news, as without that we’d be without any justified hope, near to psychogene death. It has been some time now that I searched the Internet again and again, for a group of people with the same style and interests as mine. You know, expedition style, interested in God’s supernatural acts, living in and developing development countries, all that stuff … . Now today about 0.00 AM I found the first group that’s close to the target! I mean, really close. I watched some of their videos and thought, wow, they have scenes I wanted in my vids in some years 🙂 The organization is called Overland Missions, and they do evangelistic outreaches and humanitarian help for “forgotten people” in their villages. Mainly in Africa, but they also do expeditions all over the world. The next day the team was doing door-to-door ministry when they met a woman that began to share her testimony with the interpreter. It was at that moment that Lindsay realized that the woman that she prayed for the day before had been healed overnight. Sounds incredible? If you can’t believe it, go yourself and check these stories yourself. Or, join me for that 😉 After all, if this is all true: it’s so way cool to have a God who proves himself to this wrecked world in such majestic ways!!! Posted in [All], [English], Quantified Supernatural Sciences, social change. 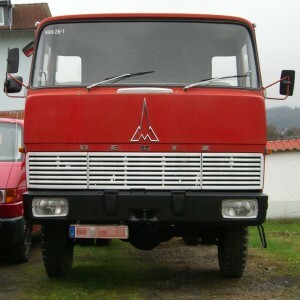 Details about my truck "Trolf"
Ok … now that I bought the truck on (Thu) 2008-11-27 and paid it and drove it home on (Tue) 2008-12-09, it’s really time to write something about that little adventure, and give some technical details. Sadly, without a video clip for now, as I currently have troubles uploading to JumpCut to edit the clip there (though JumpCut is a great tool, of course). This engine is also used in some Deutz tractors). 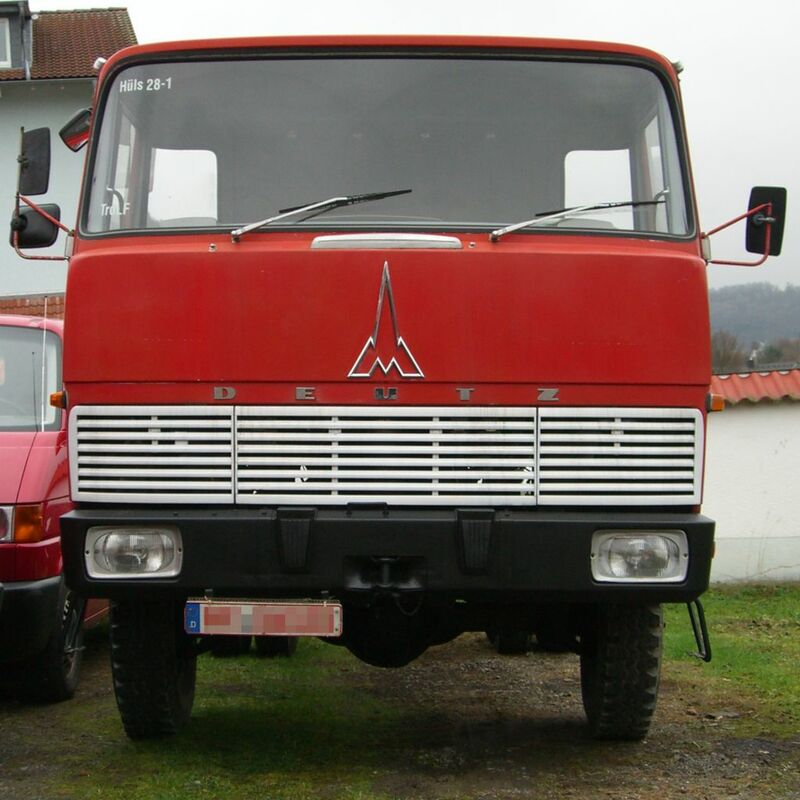 By the way, the super-sized VW bus and the crumbled houses in the back are just a result of a panorama combination of images, as I could not find a suitable position for making a side image of the whole truck.